Bannister Lake played a vital role at this year’s US Open at the USTA Billie Jean National Tennis Center in Flushing Meadows, NY. Bannister Lake’s powerful data engine Chameleon served as the data management solution for multiple data feeds from a diverse set of sources. 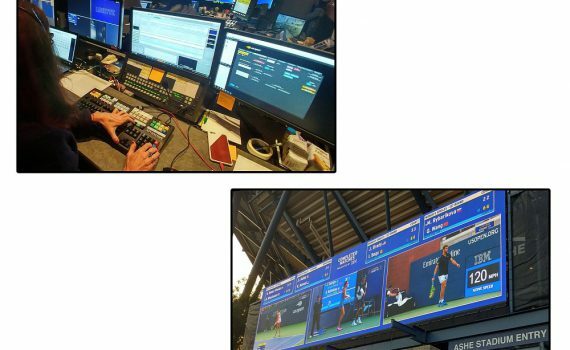 Chameleon was used to reformat, filter, moderate and distribute data and graphics to dozens of various shaped digital signs throughout the tennis facility. Bannister Lake was instrumental in devising the workflows and processes that handled over 250,000 XML files corresponding to the participation of over 1000 players playing hundreds of matches. The complexity of the project was compounded with Chameleon also taking on responsibility for managing other data sources including weather, event news, social media, schedules, headshots, scores, sets winners, standings and other tournament related data. Player’s personal biographical data such as place of birth, height, weight, handed and others information was also included. “We knew Bannister Lake’s Chameleon could handle the complexity. It’s the industry’s most powerful engine for aggregating any data type and it’s the only way we could have pulled off the US Open project under the extreme time constraints; that and all the hard work by our team.” said Georg Hentsch, President Bannister Lake. “Our extensive work in both the broadcast market and in eSports prepared us for the production challenges of the US Open. Chameleon has powered a variety of event-based productions, most notably eSports tournaments which typically includes hundreds of matches played over a short amount of time with a large number of players. So, we were more than ready.” said Alain Savoie, Creative and Technical Director at Bannister Lake. Bannister Lake’s unique workflow was built around leveraging the single Match ID unique identifier which was used to drive all the data associated with a particular match. Chameleon was then able to use automation to populate the various graphics templates and tickers that were in turn distributed via Ross Video’s Tessera and XPression graphics engines to the screens throughout the facility. In total, 7 XPressions running simultaneously with 15 output channels, displaying 15 different screen layout styles were utilized. In addition, 11 tickers running different content on different layouts were also being used. In addition to Chameleon, Bannister Lake provided a complete cloud-based backup system and their unique Community data service. Community allowed editorial and production teams at the US Open to contribute news and essential information to the hundreds of thousands of tennis fans who attended the event.